Love (Amour) was named winner of the Palme d'Or, three years after Haneke previously won for The White Ribbon. Danish actor Mads Mikkelsen won the best actor prize for The Hunt, while the actress prize was shared between Cristina Flutur and Cosmina Stratan for Romanian movie Beyond the Hills. British director Ken Loach collected the Jury Prize for The Angels' Share. The winners were revealed by the head of the jury, Italian director Nanni Moretti, on the final night of the 12-day film festival. 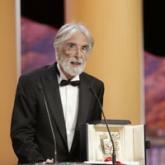 Haneke's film focused on an elderly couple whose relationship is tested when the wife suffers a series of strokes. The central roles were played by French actors Jean-Louis Trintignant and Emmanuelle Riva, who joined Haneke on stage to collect the Palme d'Or. "This film is an illustration of the promise we made to each other, if either one of us finds ourselves in the situation that is described in the film," said Haneke. The Grand Prize, considered the competition's second place, was won by Matteo Garrone's Italian satire Reality. Carlos Reygadas was named best director for the surrealist tale Tenebras Lux. Ken Loach was showing a very different film to gritty Irish war drama The Wind That Shakes the Barley, which won the Palme d'Or in 2006. The Angels' Share is a dramatic comedy about a visit to a whisky distillery by a group of misfit young offenders who are inspired to change their lives. Speaking from Cannes Ken Loach told BBC Radio Four's Today Programme: "It's about a handful of those people who face a life with no real place in society because there is so much unemployment. "It's partly serious, partly comedy. "Underneath the humour is the point that this is a tragedy we've inflicted upon a generation and it doesn't have to be this way, it's not inevitable. But the economic system drives us to this and that's not acceptable, we need to resist," he said. Head judge Moretti, who was joined on the jury by Ewan McGregor, British director Andrea Arnold and actress Diane Kruger, said none of the winners had been a unanimous verdict. He said the biggest divisions had been over Leos Carax's surreal time-travelling Holy Motors and Ulrich Seidl's drama Paradise: Love.